This blog is Part II of a series on the role of public-private partnerships (PPPs) in global health financing, priorities, and policies. Public-private partnerships for health have made international headlines since my last blog, which introduced PPPs and the different forms that they take for health programming. This month, for example, the Health Ministry of India proposed a radical PPP – which will provide one-time seed money for private companies to develop infrastructure at public district hospitals – and the new Director of the United States Centers for Disease Control and Prevention (CDC) partnered with Coca Cola for an obesity prevention programme. These developments bring two major questions to the fore: when did PPPs become a major model for investing in global health? And, what are some of the repercussions of this increasing turn to the private sector for development assistance for health? This blog briefly tackles the first question, with a short description of the history and proliferation of health PPPs. Stay tuned in September for my next blog in the PPP series, which will summarise arguments about their strengths and risks. Public-private partnerships date back to at least the time of the Romans, but their surge for health activities only began in the 1990s. A basic survey of PubMed articles with the terms ‘public-private partnership’ and ‘health’ illustrates this trend; no articles were found before 1985, and over 50 focused on health PPPs in 2016. Much of the rise in health partnerships has been driven by two players, themselves private foundations – the Rockefeller Foundation and the Bill and Melinda Gates Foundation. These champions of PPPs contend that governments cannot deliver services to achieve universal health care (UHC) and meet the needs of their populations; according to this logic, partnerships with the private sector will catalyse critical investments in health for the world’s neediest citizens. The Rockefeller Foundation began to provide funding around 1990 for product development PPPs. This type of PPP encouraged the transition from ad-hoc governmental and multilateral collaborations with individual drug or vaccine candidates to a focus on ‘portfolios’. Such portfolios allow product development PPPs to promote development of a number of different candidate products at a given time, which reduces the risk to both the public and private partners. The International AIDS Vaccine Initiative (1996) and the Medicines for Malaria Venture (1999) are often considered the first examples of this type of portfolio PPP. In 2001, the Bill and Melinda Gates Foundation –the world’s second largest funder of global health initiatives in 2015 – formally entered the PPP scene. It funded the now defunct Initiative for Public Private Partnerships for Health, and tasked it with cataloguing new and existing PPPs for health. In 2004, the IPPPH identified 91 PPPs for health, and a 2007 report deemed the PPP model to be a successful experiment. How much growth has occurred since the IPPPH report was released ten years ago? The short answer is: a lot. Since 2000, the Global Fund to Fight AIDS, Tuberculosis, and Malaria and Gavi, the vaccine fund have been launched (for more, see Chelsea Clinton and Devi Sridhar’s ‘Governing Global Health’ book). These PPPs are now the largest multilateral contributors to development assistance for health, surpassing the World Health Organization’s commitments, and the Gates Foundation continues to be a major funder and influential board member of many PPPs. Comprehensively tracking the plethora of smaller PPPs is extremely challenging, as no centralized listing of major health PPPs and their funding exists. However, one can gain a glimpse into some of the dominant focuses of and corporations contributing to PPPs through the International Federation of Pharmaceutical Manufacturers Association’s (IFPMA)’s World Health Partnerships Directory. This website provides lists of research-based pharmaceutical industry partnerships around the world, and identifies more than 200 pharmaceutical PPPs (either currently in operation or completed since 2010) in developing countries. The graphs below pull-out some basic PPP characteristics from the IFPMA directory. For example, more of the PPPs focus on either HIV/AIDS, malaria and tuberculosis or reproductive, maternal, neonatal, child, and adolescent health (RMNCAH) than any other health category. Interestingly, a large number of PPPs are also focused on neglected tropical diseases, which have traditionally received a very small percentage of development assistance for health. 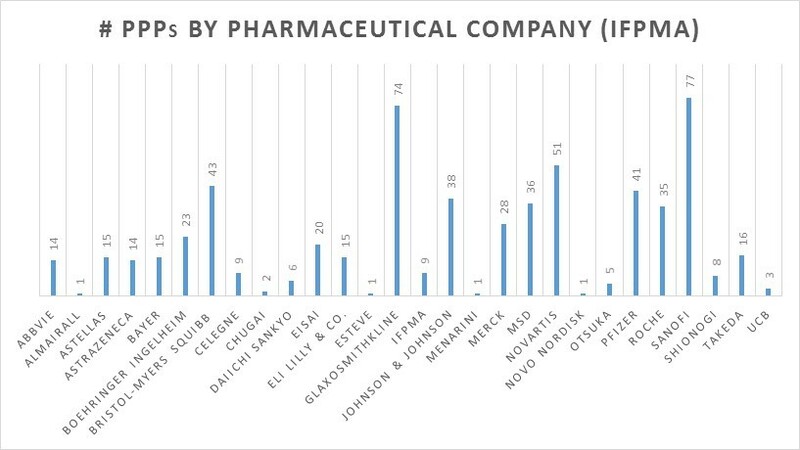 And, while about 25 pharmaceutical companies were involved in some sort of health PPP, a few companies - Bristol-Myers Squibb, Glasosmithkline, Johnson & Johnson, Merck/Merck, Sharpe and Dohme (MSD), Novartis, Pfizer, and Sanofi – are collectively represented on over half of the total PPPs. Thus, PPPs often support vertical (disease-specific) health initiatives and marshal money from a few major private actors (particularly the Gates Foundation). However, more research is needed to understand if they actually draw new investors into global health, how they impact health systems, and what motivates private actors to invest in them. Merck’s donation of ivermectin for onchocerciasis through the Mectizan Donation Programme (a PPP), for instance, is not purely humanitarian; it has given Merck tax credits in the United States and positive public relations (including the title ‘The Moral Corporation’ and a Nobel Prize to one of its scientists), and there is a danger that limited-time drug donation schemes may undermine generic drug markets. A first step in tackling the impacts of health PPPs in developing countries may be to create a more comprehensive health PPP directory, which would allow for the analysis of major health PPP funding patterns. The next blog in this series will outline the major research that has been undertaken on the health impact of PPPs over the last fifteen years. It will be brought to you in September 2017. In the interim, keep checking our website for other new blogs on critical global health governance topics, which will be posted every two weeks!